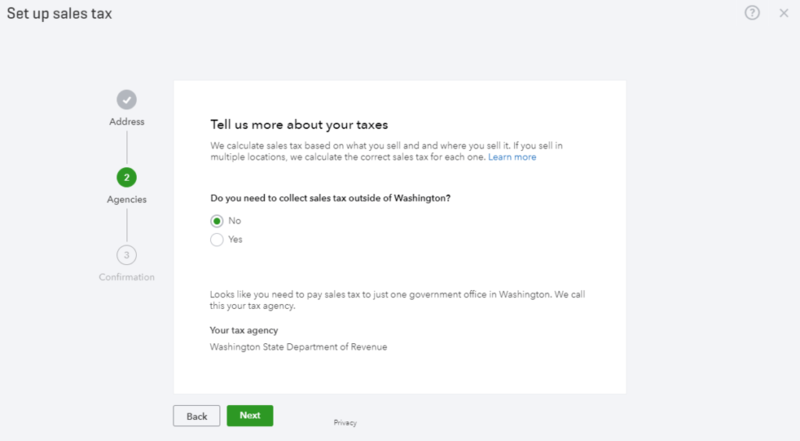 Some bad news for Washington state QuickBooks Online users who need to report and pay Washington state sales tax. The bookkeeping requires some… well, extra attention and fiddling. But let me explain what’s what and then walk you through the steps for doing the bookkeeping. 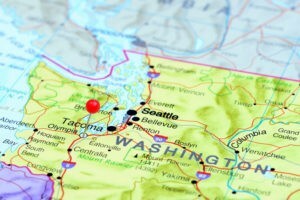 What’s the issue with Washington state sales tax? 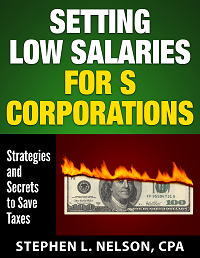 Sales tax isn’t the only type of excise tax Washington State levies on businesses. It also levies a tax on gross receipts, often referred to as “B&O”. What Intuit has done in QuickBooks—again, to try and make things easy for small business owners—is it’s come up with a system for how it can take care of most the bookkeeping for sales tax behind the scenes. 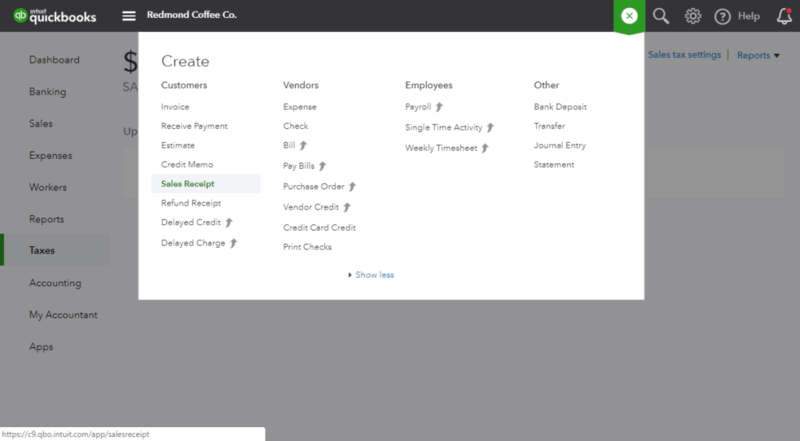 The QuickBooks system is to have a special feature, called “sales tax tracking,” to automatically calculate correct sales tax on invoices and sales receipts, as long as sales tax jurisdictions have already been set up, and as long as the person recording the invoice can identify which sales tax jurisdiction to use when recording the transaction. 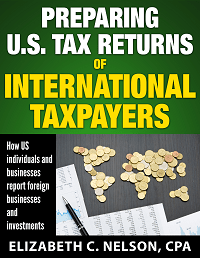 Then, when a business remits sales tax to the proper taxing agency, the bookkeeper records this event with a special type of transaction. QuickBooks calls this transaction a “sales tax payment.” In order for QuickBooks sales tax tracking to work properly, the business must record every sales tax payment as, well, a “sales tax payment,” and it must record only sales tax payments as sales tax payments. You can see how this approach collides with how Washington State collects sales tax. 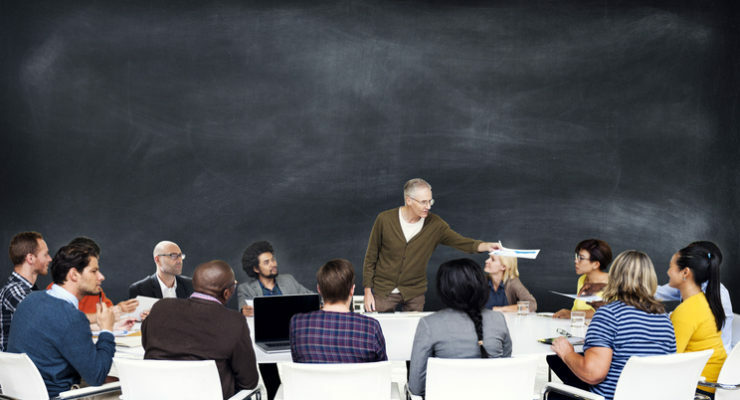 Two systems that were supposed to make things easier have come together to make things much more complicated and difficult for Washington small business owners. Luckily, there are two workarounds to this conundrum. 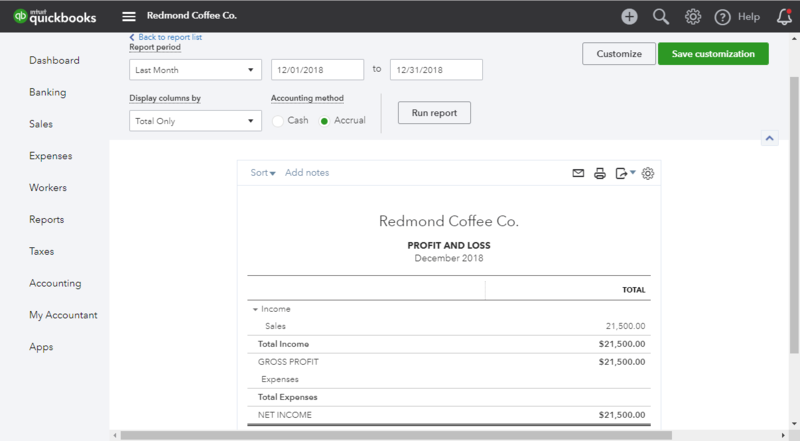 The upside: this is easy to record, and easy to make accrual vs. cash basis accounting work correctly in QuickBooks (assuming your version of QuickBooks allows you to track Accounts Payable). The downside: it makes working in the bank feed and reconciling the bank account more complicated, because the single payment that posts to the bank’s ledger won’t match the two separate payments you recorded in QuickBooks. The downside: this method is more complex to enter, and WA B&O payments won’t show up properly on accrual-basis financial statements. The tutorial at the end of this article will show you how to use this second workaround, and it will also illustrate the limitations of this workaround. A quick clarification: Which sales tax system are we talking about? 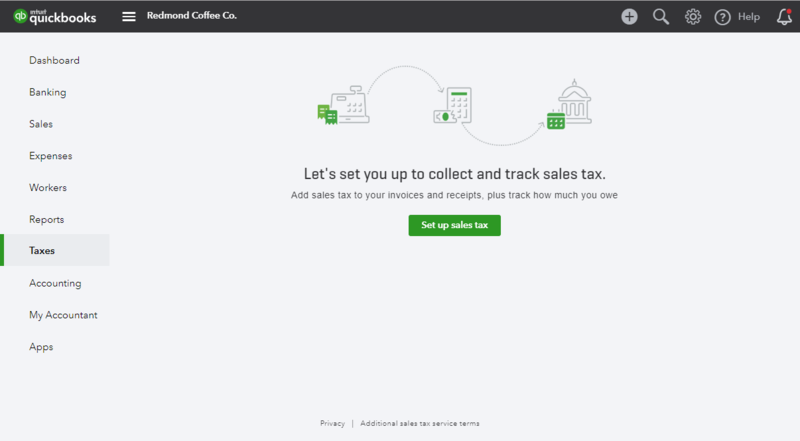 QuickBooks Online has two different sales tax systems: old and new. The old system is like what’s available in QB desktop, where the user manages their own sales tax rates. This system works just fine for brick-and-mortar shops that don’t deliver their goods to customers and only have a handful of locations. 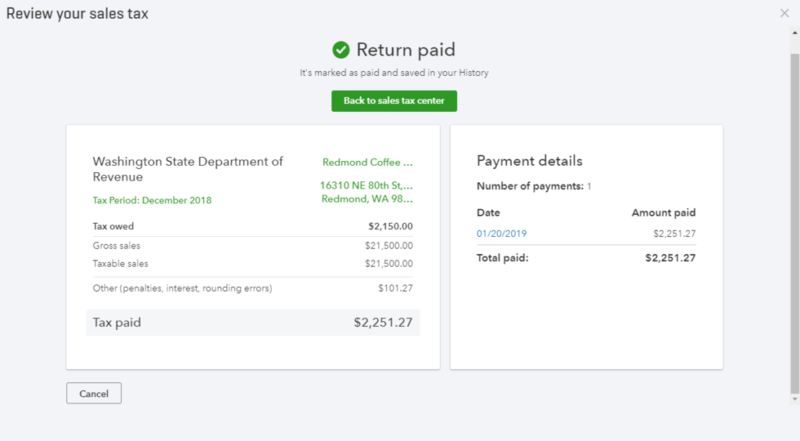 The new system, called “Automatic Sales Tax,” appears to be Intuit’s answer to AvaTax and TaxJar, but it doesn’t cover as many jurisdictions yet. This system is designed to work better for stores (whether online or brick and mortar) that deliver goods to their customers, and thus have hundreds, or maybe even thousands, of sales tax jurisdictions to keep track of. 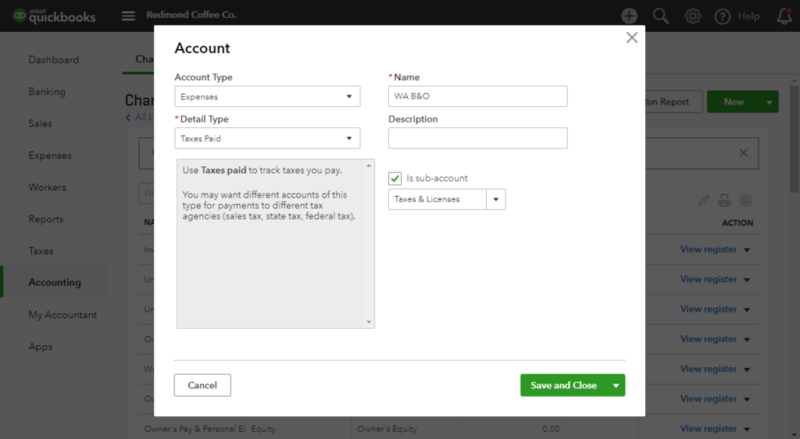 As of this writing, new QuickBooks Online accounts start off using the new, more-automated sales tax system. Accordingly, the images in this article illustrate the new system (because that’s what we had to work with when we created a demo account for this tutorial). If you use the old system, stuff will conceptually work much the same way, but the interface will look a little different and fewer tasks will be automated. Note: these images come from QuickBooks Simple Start. 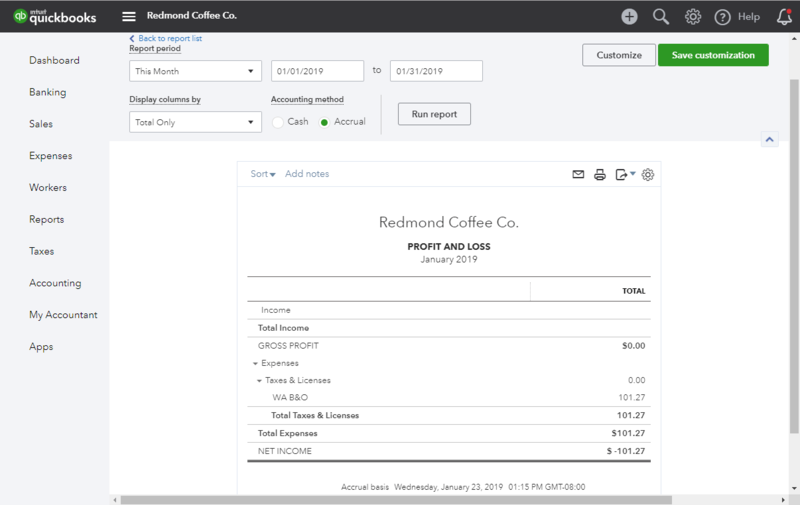 If you use a different version of QuickBooks Online, or if Intuit has just updated the user interface since we published this article, then what you see in the software might be a little different then what we show below. 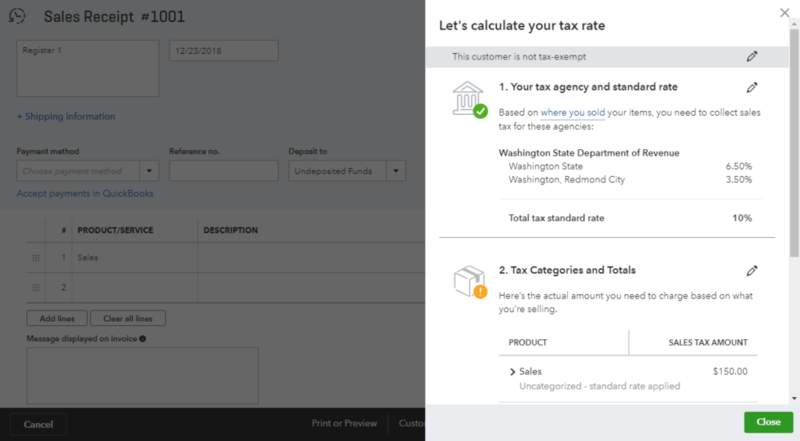 If you’ve already set up sales tax in QBO, skip ahead to the next section. But if you’re just getting started, this section is for you. 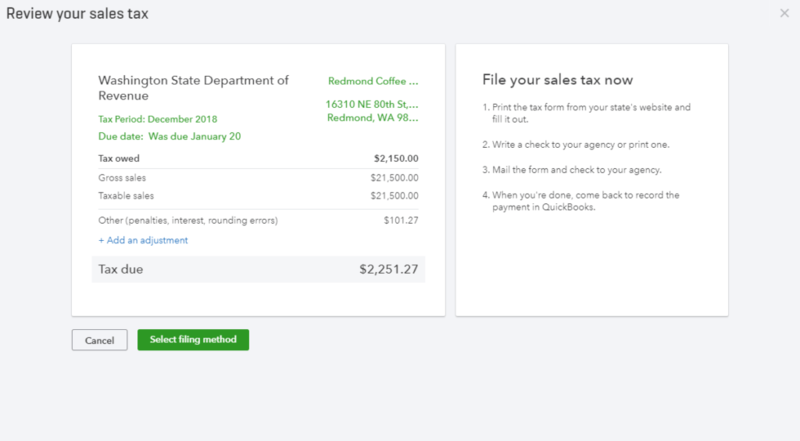 As I mentioned earlier, if you’re setting up sales tax in a brand-new account from scratch, QuickBooks Online will guide you through the process of setting up Automatic Sales Tax. 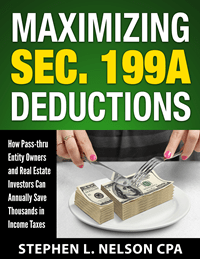 The address you use for this step is important, because it tells QuickBooks what taxing jurisdiction you’re in. For example, our hypothetical coffee shop is located in Redmond, WA. 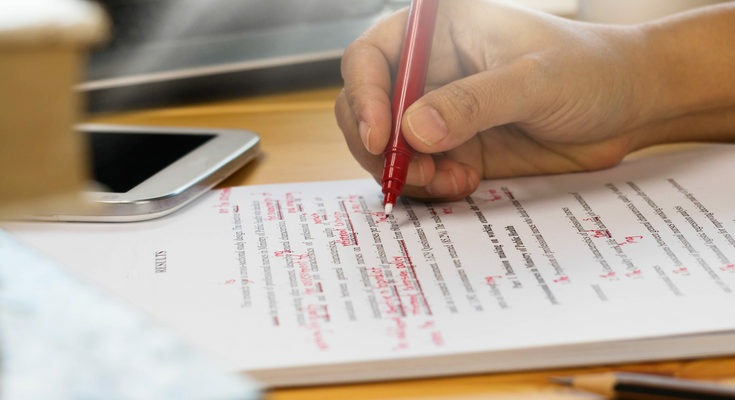 That means that, as of this writing (and for the purposes of this example), its sales are subject to a state sales tax rate of 6.5% and a local sales tax rate of 3.5%. 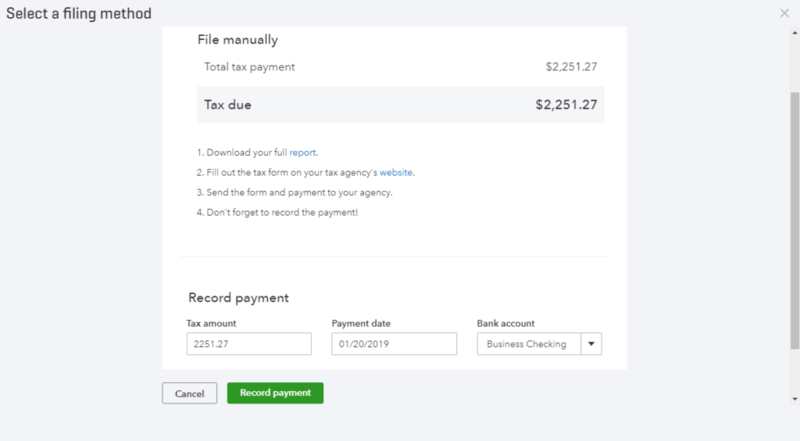 Note that if you’re using QuickBooks’ old sales tax system, or if you’re using sales tax tracking in QuickBooks desktop, you’ll need to look up these rates yourself and add them to the program manually. You’ll also need to update the rates manually any time they change. 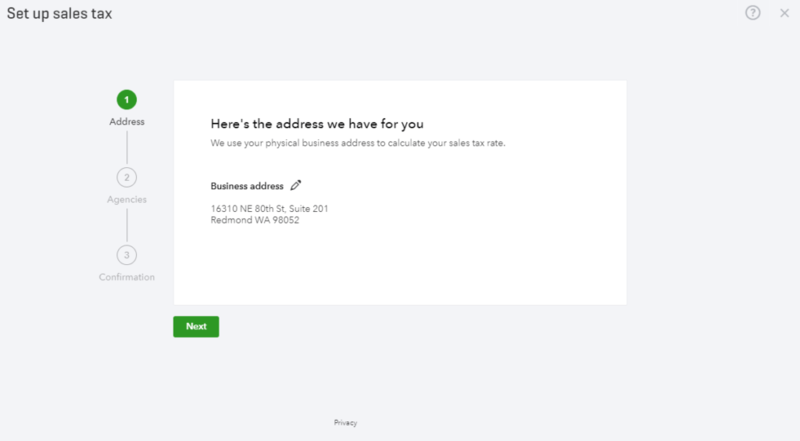 But if you’re using Automatic Sales Tax in QuickBooks Online, QuickBooks will use the address of the sale location as the jurisdiction for the sale. Three other quick points before I move on. 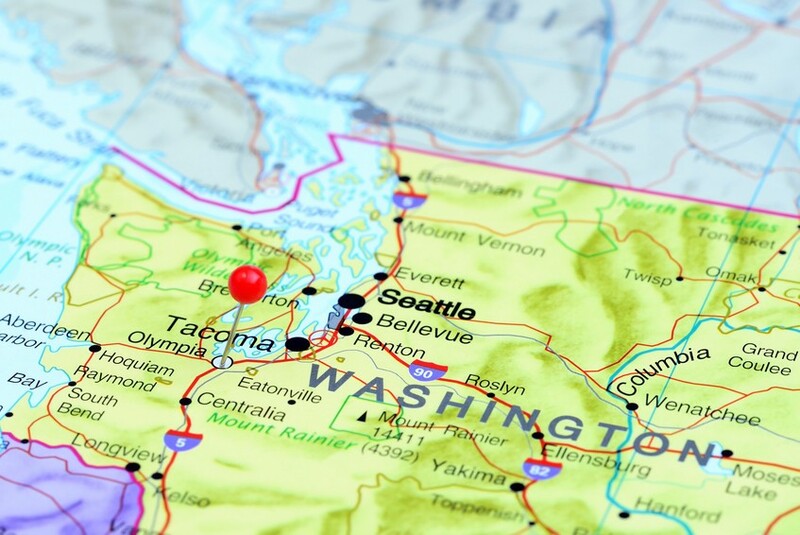 First, in Washington State, we have what’s called “destination-based sales tax.” That means if your business operates in, say, Duvall, but you sell a product to a customer in Redmond and deliver the product to the customer, you need to use the Redmond sales tax rate for the sale. If, on the other hand, you have a bricks-and-mortar shop in Duvall, and you don’t deliver to customers (i.e. you only sell and transfer title to your goods at the Duvall location), then you use the Duvall rate. Second, note that even if two jurisdictions use the same local rate (for example, both the City of Redmond and the City of Bellevue have a local rate of 3.5%), you can’t just use the same sales tax item for Bellevue sales and Redmond sales. This is because when you go to file your sales tax return with the Washington Department of Revenue, the form is going to ask how much of the sales tax you’re remitting is Washington State’s share, how much is Bellevue’s share, how much is Redmond’s share, and so on. So, you’ll need your accounting system to provide you data not just on how much sales tax to collect, but which jurisdictions you’re collecting it for. The Washington Department of Revenue keeps a list of current and historical local sales tax rates here. It even has a file you can use to import tax rate information if you’re using a desktop version of QuickBooks. This isn’t an issue to worry about if you’re using Automatic Sales Tax in QBO (or a similar product like AvaTax or TaxJar), but if you’re using an older, less-automated version of sales tax tracking in QuickBooks, it’s a mistake that novice small business owners can sometimes make. Finally, if you’re in a business where you sell tangible goods and deliver them to out of state customers, you want to get up to speed on the recent Supreme Court case South Dakota v. Wayfair. You may have an obligation to collect sales tax not just in Washington, but in other states as well. After this initial setup, QuickBooks will ask you how frequently you file sales tax in Washington State (see below). Your business’ filing frequency is based on your estimated sales tax liability. In our example, the combined state and local sales tax rate is about 10%. 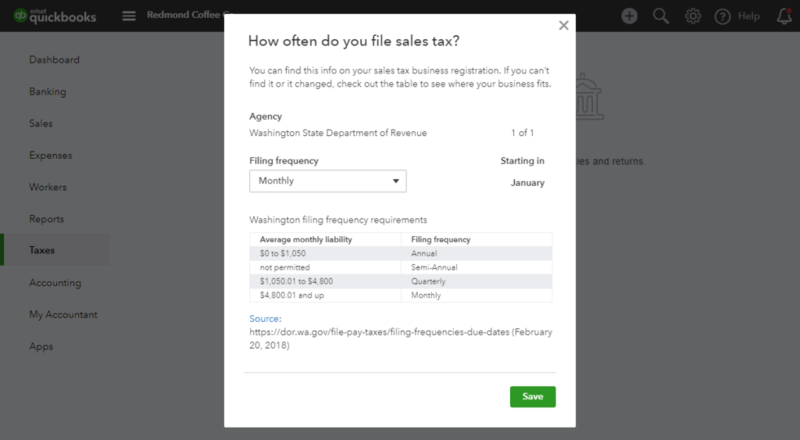 So, a business with about 48,000 or more in monthly taxable sales would need to file monthly, whereas a business with smaller sales volume might be able to file quarterly or even annually. All right, that’s sales tax set up. 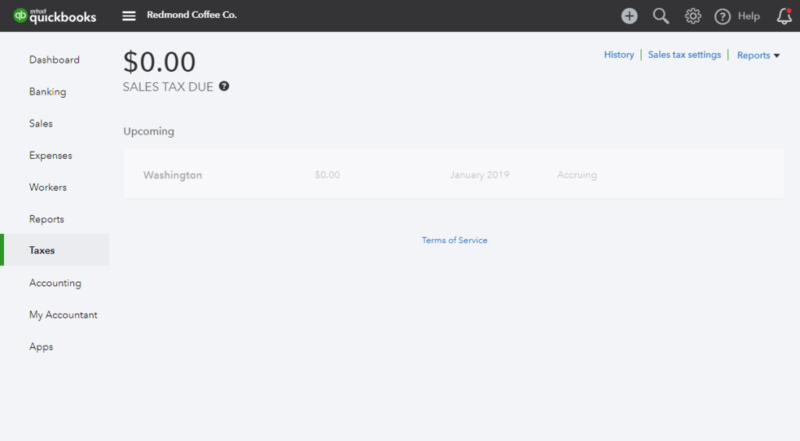 But for Washington State businesses, there’s one final step you’ll need to take to get things really working right for recording payments, and that’s creating an account in the chart of accounts for Washington B&O (see below). 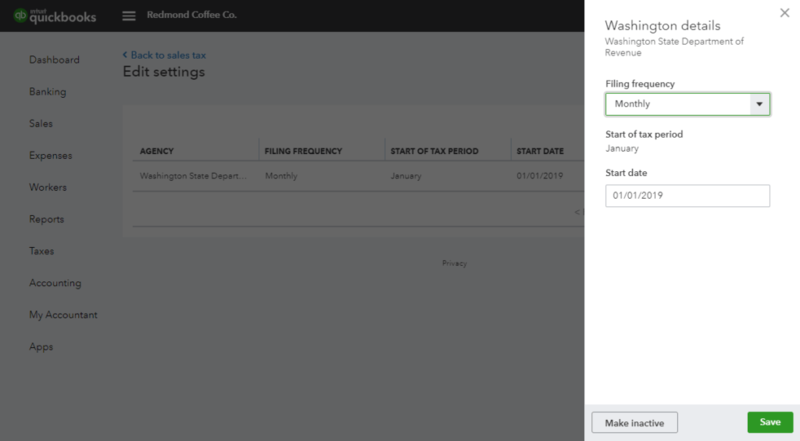 Once you’ve set up sales tax in QuickBooks Online, you’re ready to start recording sales receipts that include sales tax. To do so, first, click the Plus icon, then click Sales Receipt. Okay, we’ve set up sales tax and we’ve been recording our sales receipts in QuickBooks to automatically calculate sales tax. And now a month has gone by, and we have to record the tax payment made to the Washington DOR. How do we do that? Well, here’s what it will look like when you use the sales tax adjustment method in QuickBooks Online. When a sales tax return is fileable, you’ll see a button in the sales tax center that lets you record the payment. Click this button and you should see a screen that looks something like the image below. 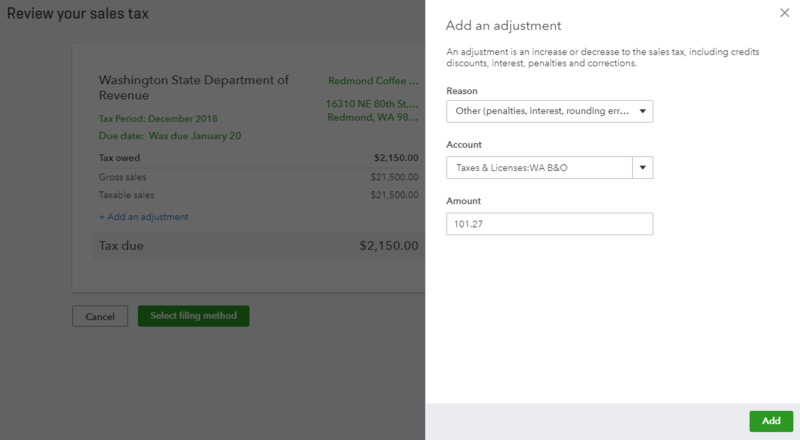 Once you’ve added the adjustment, the amount QuickBooks indicates for Tax Due should be the same as the amount you actually paid with your Washington Excise tax return when you filed it using MyDOR. (We have more information on MyDOR accounts in this article on our blog.) If the amount looks correct, click the green “Select filing method” button. 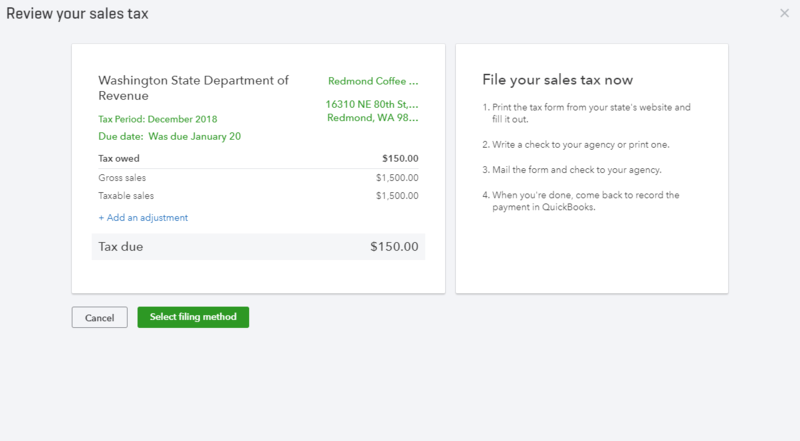 This is the last screen you’ll see, and it just confirms you recorded the sales tax as paid in QuickBooks. There’s a lot to like about the sales tax adjustment method as a workaround for dealing with Washington B&O. It’s not too much work, it gets the right number in the right account, and because it records a single payment in the register for your business bank account, it keeps bank account reconciliations and working in the bank feed easy. 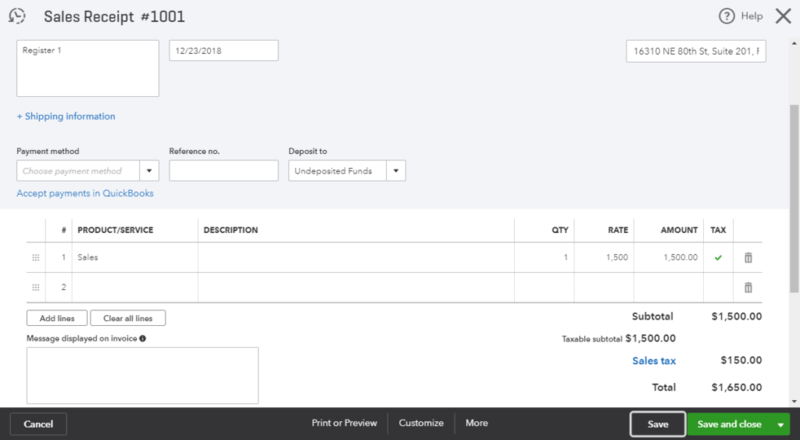 The one major drawback to be aware of is that, using this method, Washington B&O expense will only show up as an expense as of the date the expense was paid, regardless of whether or not you’re generating reports on cash or accrual basis. In other words, you won’t be able to track B&O accrual’s properly with this method (as shown below). And there you have it, that’s how you deal with Washington sales and B&O tax in QuickBooks Online.